BARACK OBAMA MAY have a petrol station in Offaly named after him, but the man due to replace him in the White House boasts a whole five-star hotel and golf course in the west of Ireland to call his own. And while some have questioned Donald Trump’s business nous, the property mogul and reality TV star appears to have at least sealed a good deal when it came to Doonbeg Golf Club & Lodge, the property in Clare that he bought in 2014. But how did he come to buy it – and how has the resort performed since it has become part of the Trump empire? When golf began to significantly gain popularity in the 90s, some people at the Doonbeg Community Development Company thought that the region would make a good spot for a course. They got in touch with Shannon Development, the then-regional development body for the Shannon area. The agency identified and acquired about 380 acres of land that it thought would be suitable for a high-end course, and then went looking for a developer to get the project off the ground. US company Landmark International became attached to the project. In 1999 the firm brought in Kiawah Development, which had built the Kiawah Island resort in South Carolina for the 1991 Ryder Cup, to help with the project. The old-style links course was to be right beside the sea and was designed by Australian Greg Norman. Widely recognised as one of the best golfers of his era, he held the world number-one spot for over 300 weeks in the 80s and 90s. Norman had been involved in the design of over two dozen courses before he got to work on Doonbeg. The reported cost of the development of the resort and course ranged between €30 million and €40 million. However the company behind the facility struggled to make money from the get-go and racked up big losses, even during the boom years, reporting a deficit of €3 million in 2006 and €7 million in 2007 after first opening to visitors in 2002. In an effort to turn around the losses, the firm sold several luxury suites to investors during the Celtic Tiger period. The investors leased the rooms back to the hotel and expected an annual income. However, the resort, which was majority owned by Kiawah CEO Charles Darby, continued to struggle and was the centre of legal action. In 2012, Doonbeg’s minority shareholders, who included several of Darby’s cousins and extended family, filed a lawsuit against the chief demanding that the company be sold, with any proceeds to be shared among the business owners. A year later Kiawah was acquired by US-based property investment firm South Street Partners – and the new owners didn’t hold onto Doonbeg for long. The Clare resort, which at the time employed about 245 people during its busy season, was placed into receivership as the company’s losses continued to mount. Doonbeg’s accounts for the end of 2012, the last filed before it sought court protection in January 2014, show that it had debts of €80 million. This was where Trump came in. The businessman was already familiar with the resort before it went into receivership. Speaking to the Irish Times in May 2014, Trump said four years earlier he had sent a team of architects to take a look at the hotel. “I said at the time, ‘I wonder if I will be able to buy it’ and I actually tried buying it and I wasn’t able to,” he told the newspaper. With Kiawah, controlled by its new owners, looking to draw a line under the Doonbeg’s debts, Trump spotted an opportunity to pick it up on the cheap. “It was one of those things. I closed that deal in less than five hours. There are not a lot of people who are able to do that,” he told the Irish Times. At the time, it was reported that Trump had paid about €15 million for the business, although a report from Doonbeg’s receivers filed in August 2014 show that the proceeds of the sale from the golf club amounted to just over €8.7 million. The old company running Doonbeg was liquidated, meaning that Trump was able to take over the resort and golf course debt-free. The Donald set up a new firm, Tigl Ireland Enterprises, to handle the running of Doonbeg. 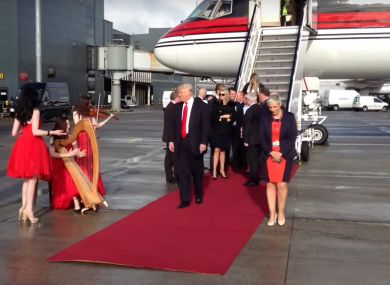 Trump arrived in town shortly after buying the company – with Finance Minister Michael Noonan famously, or infamously depending on your views, rolling out the red carpet – and promised to pour cash into Doonbeg, creating much-needed jobs in a region decimated by the recession. He also suggested that more investment could be attracted to the area as a result of the ‘Trump effect’. “It could be that other things happen because of it, and also other investment will be made in Ireland — because a lot of times, when I go to a community, I’ll make an investment and then I’ll make other investments in totally unrelated things because I’m here,” he said at the time. Since Trump took over, a €5 million-redesign of the course has been unveiled – while the property tycoon has also battled planning headaches as he struggled to build an Atlantic wall to protect the land against coastal erosion. Although the company made a €2.5 million loss in the year after Trump acquired the resort, that was an improvement on its previous performance. An impairment charge of €1.8 million, listed as ‘acquisition costs’, contributed most of the company’s losses. Its operating loss was just over €700,000, similar to the operating loss recorded in 2012. More recently, financial disclosures filed this year with the Federal Election Commission in the US, as part of the campaign to secure the Republican nomination for the presidential election, revealed that Trump put a value of €23 million on Doonbeg. But Doonbeg’s performance is unlikely to weigh on Trump’s mind too much, not least because the incoming president now has a few bigger issues to worry about. And also, as the tangerine tycoon has already said, to him the money is only small potatoes. Email “How the US president-to-be picked up a Clare golf resort for a song”. Feedback on “How the US president-to-be picked up a Clare golf resort for a song”.